Stephen and I have been on the hunt for the perfect pancake pan. We like to make pancakes together – sometimes on a Saturday for lunch with the Frompson crew, and sometimes just the two of us on a Sunday morning. We have yet to find the perfect pan for our pancakes. A few weeks ago, Stephen found the perfect single-egg pan (photo: top right). Jealous, I want a perfect pancake pan. It needs to be small, and much shallower than a normal frying pan to make it easier to get the pancake out. And today, I thought I had a contender: it was small, round and shallow (photo: bottom left). It advertised itself as a non-stick pancake pan. Well, I can tell you now, the advertiser LIED! We took it home and tried it out. According to Stephen (our chief pancake-maker), it is the opposite of a non-stick pan. It is a stick-to-me-like-glue pan. It’s going straight back to the store tomorrow. 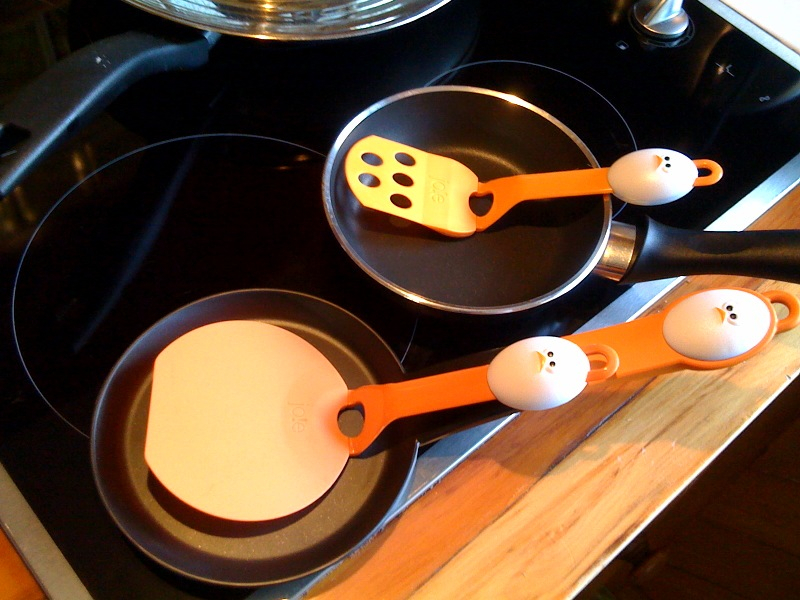 We also found some fun little cooking implements – a pancake flipper and an egg spatula. The little egg spatula is great, just what we needed. The pancake flipper was also an EPIC fail. It MELTED onto the pan. It’s going back tomorrow too. And until we find something better, we will continue to cook our pancakes in the perfect egg pan. I also burned the top off my left index finger with the stupid pancake pan, so I hate it extra. If it wasn’t so expensive, I would destroy it with my wood-chopping axe.